Everyone needs to build a credit history. It is very important that you have yours as early as possible. This history is indicated in your credit report. It simply records your credit behaviour – how much you owe, how you pay them off and how responsible you are with all your credit accounts. If your record is good, you can get a high credit score. A high score will help you secure a lot of financial opportunities that are not available to those who have lower scores. Some people actually think that this is a ridiculous requirement in our society. Why is there so much importance in building your credit reputation? After all the difficulties experienced during the Great Recession, is it really a wise idea to continue to care about credit? Wouldn’t it be better to just eliminate it from your life? This is actually what some Millennials are doing. According to an article published on FoxBusiness.com back in 2014, 63% of Millennials have decided not to own a credit card. This was based on a survey done by Bankrate. In comparison, only 35% of 30-year olds and above do not have credit cards. If you think that this will help you stay out of debt – it is not entirely accurate. Sad to say, our society, or the financial industry in particular, feel differently about credit. They view the use of credit as an important indication of your financial success – especially in relation to your credit report. A six figure income with a bad credit report to match is not something to be proud of. You may actually be better off earning a simple salary but with a good credit history. One of the easiest ways to build your history is to use a credit card. After all, you need some credit input in your report. However, this is where people are having a hard time coming into terms with. Credit cards may be a common payment method but a lot of consumers have been burned by the debt that they went through in the past. This is why most of them are having a hard time building their credit reputation. There is some hesitation in using it for fear of falling further into debt – since credit card use come with high interest rates. Fortunately, there are ways for you to build your credit history without succumbing to the dangers of high interest credit cards. It is the easiest, but if you are not comfortable with it, that are other options. Here are some of them. Use existing companies that you pay each month. We all make monthly payments outside of our credit cards. These include utility bills and subscriptions like cable or the Internet. The companies providing these services to you are not required to report your payment behaviour to the three major credit bureaus (Experian, TransUnion, Equifax). However, they can submit a report if they want to – and if you ask them to report on your behalf. Simply call them and ask them to submit a report just so you can have a record of good payment behaviour. If you are renting, you can even ask your landlord to submit too. Any consistent and recurring monthly payment may be submitted to help add to the data in your credit history. Take note that since this is not a requirement for them, they could deny your request. Get a small loan from a credit union. Credit unions, although they provide almost the same financial services and products as banks, are actually quite different. Credit unions revolve around their members. This is why a lot of them have membership restrictions. If you find a credit union that you can join, open an account with them and apply for a small personal loan. They offer lower interest rates compared to the traditional banks. This will help you put some credit data in your credit history so you can show that you are responsible with your payments. In case, you find it hard to get an approval for a loan, you might want to open a secured loan wherein you will use a savings account that you have with them as collateral. This will lower your credit risk and thus increase your chances of getting an approval. Apply for an installment loan from a retailer. Retailers of expensive items allow customers to take out an installment loan on purchases. This will require you to make timely payments for a specific period of time. This is important if you cannot even apply for a loan with a credit union. Not only will this be a record in your credit history, it could also help increase your credit score because having variety in your type of credits will affect 10% of your score. Sometimes, in an effort to get customers to pay, retailers offer these loans with little or even no interest rate for the first few payments. Opt for peer to peer loans. This is a relatively new way to borrow money. It is usually done online so you need to explore this via the Internet. The popular companies offering peer to peer loans are Prosper and Lending Club. These are simply platforms where investors from the community meet with borrowers. That means, the financing for the loan that you apply for will be coming from investors in the community. The risk is lower so the interest rate for peer to peer loans are smaller compared to traditional banks. The chance of you getting a loan approval is higher here. And since peer to peer lending companies are required to report to the credit bureaus, your credit behaviour will be recorded in your credit history. If you have existing student loans, you can use this to help display how responsible you are with your credit accounts. According to NOLO.com, these loans can help you build a payment history. Make sure you practice proper payment behaviour as it will be recorded in your credit report accordingly. And in case you are planning to go to graduate school, you may want to use your federal student loans to help you get more data into your credit report. All of these options should give you a chance to build your credit history. Just remember that it is not ownership of the loan that will give you a good credit reputation. It is how you behave in relation to that debt. If you stick to your payment schedule and you always pay the right amount, then you can be assured of a credit history that can reflect a high credit score. The truth is, it is all about proper credit management. Even if you have a high amount of debt (which is really not recommended), as long as you can keep up with payments, you will have a good record in your credit history. The thing about your credit report is it needs consistent good behaviour. Even if you start with a good report, one mistake can ruin that good record. It is something that you need to take care of for as long as you want to make financial transactions work in your favour. Only borrow what you can afford to pay. This does not mean you should look at your income to determine how much you can borrow. You need to also consider how much debt you currently have and the expenses that you need to pay for every month. If you have to base it on your income, make sure that it is on your disposable income. This is the income that is left after all your other expenses and payments have been paid off at the end of the month. Practice the right payment behaviour. This is 35% of your credit score. If your credit history shows that you do not pay on time and you fail to meet the minimum payment requirement, you will be viewed as an irresponsible credit holder. That will make you a high credit risk because lenders will view you as someone who cannot be trusted with credit. You will either be denied of your loan application or given a higher interest rate. Monitor your credit report. Sometimes, people end up with ruined credit reports after being a victim of identity theft. CNN.com reported that in 2014, the top complaint from Americans (as compiled by the Federal Trade Commission) involves identity theft. The only way that you can detect this is by looking at your credit history every now and then. You need to look at the records to ensure that everything reflected there are all your financial transactions. If there is one entry that you are not familiar with, then you may want to check that out and have it removed. 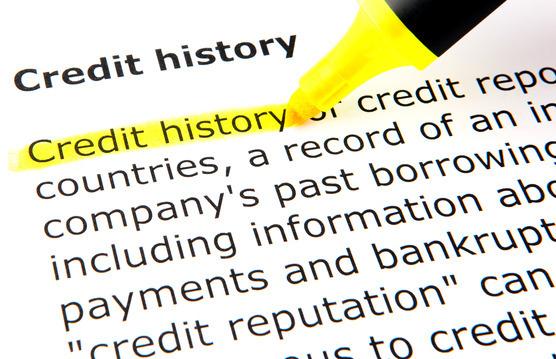 Credit management will help you maintain a good credit history. But to practice proper credit management, you also have to practice the right financial management habits. This includes budgeting, saving and smart spending. Being cautious with your financial decisions will ultimately help you improve your current financial standing. Here is a video from the Bank of America to help you build a better credit report.